The Palais de Chaillot in Paris is where, on December 10 1948, the United Nations General Assembly adopted the Universal Declaration of Human Rights. The Palais de Chaillot is now the Théâtre National de Chaillot, and in its basement theatre — Salle Maurice Béjart — Arkadi Zaides is performing Archive in which he borrows a Palestinian perspective to view transgressions of human rights by Israeli soldiers and settlers against the indigenous Palestinian population. The significance of the place is not lost on Zaides but he doesn’t reveal it until the post-show discussion: the context of Archive is undoubtedly human rights but it is not the main focus of this work. Zaides is not an Israeli by birth, having emigrated from what is now Belarus, where he was the only Jew in his school class, to Israel at the age of 11 where he was the only immigrant in his class. To better assimilate into his new environment he joined at the age of 13 an Israeli folk dance group and later trained in contemporary dance where he developed his individuality. In 1999 he became a member of the Batsheva Ensemble and joined the main company in 2001 until 2004. In a country where military service is obligatory, he refused to join the army. It was a decision he admits with characteristic understatement that required a lot of determination to sustain. Zaides is thus an insider on the outside or an outsider on the inside, which is what gives Archive its trenchant focus. Now an independent choreographer living in Tel Aviv, Zaides performs his works in Israel and is often invited to perform throughout Europe (though not yet in the UK), in North and South America and in Asia. Like the late Aleksandr Solzhenitsyn writing about the gulags, Zaides is not saying anything about Israel’s actions towards the Palestinians other than what the Israelis themselves are saying with their own bodies. The archival film that is the starting point of Archive is rough footage of transgressions by Israeli settlers and soldiers seen through the lens of cameras given to Palestinian citizens by the Israeli Human Rights Organisation B’Tselem for the express purpose of documenting them. Zaides is in turn looking at the corporal and vocal gestures of the aggressors and exploring the genesis of those same gestures — stone throwing, sheep scattering, olive branch destruction, verbal and physical intimidation, among others — in his own body. The result is visceral, poignant and disturbing to the point you wish it would stop. That is almost certainly what Zaides wants to achieve. Two weeks after the brutal attack on a Jewish supermarket in Paris, there were efforts by Jewish right-wing activists to prevent the show from opening, but thanks to the stand of theatre director Didier Deschamps, the eight sold-out performances have, in the spirit of Charlie, gone ahead as planned. Zaides is used to confrontation; he now sees it as part of his work. Performing Archive in Israel (most recently in Tel Aviv) he has met with opposition, sometimes physical, from those who find his ethical stand politically unacceptable. He has discovered attempts to shut down his funding sources in Israel and has experienced riots in Jerusalem at a talk he was giving about his work. But there is something about Arkadi Zaides that will not back down because he believes so strongly in what he is doing. You only have to look at his eyes to know that. He is not an angry man pointing self-righteously at others but uses his own body as a mirror to the society in which he lives. In Paris it is the first time he has performed this many performances together and the duress of taking on gestures of violence is taking its toll on his own body and mind. During the performance he first mimics the actions of selected individuals in the footage (and there are only Israelis in the footage; the Palestinians are behind the cameras); then he rewinds the clip and plays it again embodying in front of the screen the gestures he sees on it. He has seen the clips many times and has studied them assiduously; he has seen hundreds of hours of footage from about 4,500 hours held in the B’Tselem archive. He then shuts off the projector and repeats the actions as if they are a short choreographic phrase. Remarkably there are recognizable elements of what we in the UK might call Israeli choreography. 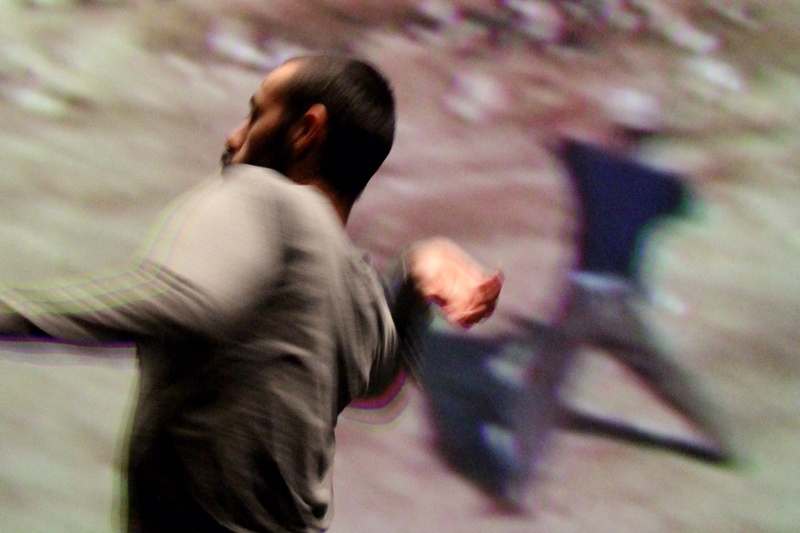 As this sequence of footage and gestural extraction progresses Zaides adds to the physical phrases vocal elements (shouting, taunts and other fragments from the recorded footage) that he vocalizes and captures on a digital loop, accumulating over the course of Archive a choreography of violence, of brutality, of inhumanity that in its starkness is deeply disturbing. This, Zaides suggests, is what we are doing to our bodies when we take on these forms of aggression. 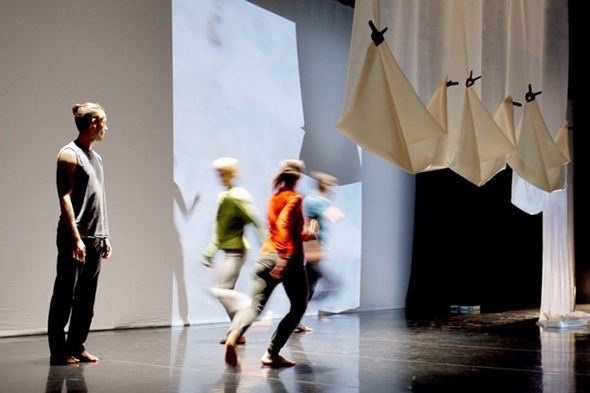 As anthropological as it is polemical, Archive takes dissent to a choreographic level that is neither abstract nor pure imitation but part of what Zaides calls his search for the real choreography: is it what we see in the theatre or is it manifest outside? Archive blurs the distinction between the two and in doing so makes a powerful, devastating statement.